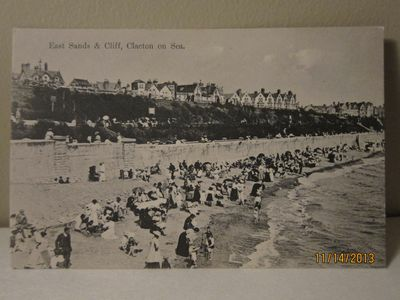 On the Front of the Card: "East Sands & Cliff, Clacton on Sea"
On the Back of the Card (Top Center): "W. & S. I." and Winova Series"
Publisher: W. & S. I. Stamp Box: Faint dotted line surrounding "Printed in the County of Saxony". Addressed area: Miss H. Newell (written in pencil). For more cards of this type, please see the full list of "Seaside Resort" Postcards. For a genealogical list (by last name of addressee) see the "Genealogy" section.